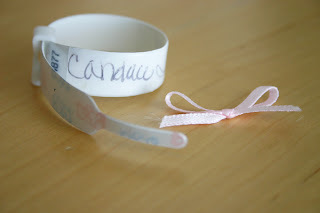 The little hospital anklet that Sadie wore when she was born. We didn't have to cut this thing because it kept sliding off her foot. Also, one of the many little bows that they kept sticking on her head. Those things would be falling off in no time. Ahhh, sweet memories of a healthy, squishy, newborn baby girl with such good color & such pretty little eyes. Looking forward to a repeat. I love the baby tags, I didnt want to throw ANY of ours away, so I scrapbooked all three!! Love it! I love that my mommy has all our new born stuff, but it kind of creeps me out that she kept ALL of our baby teeth. That is just a step to far. PS- I'm so HAPPY you guys are coming down. HIP HIP HORRAY!